It’s been a long, hard day and all you want to do is soak in a hot bath, maybe with a book or some soothing music. Adding aromatherapy to this scenario will take your relaxing bath to a whole new level. Some people use incense or Scentsy wax. But there is a little something that anyone can whip up quite quickly that will make that bath not only soothing but also beneficial to your health as well. Add a little bath salt. 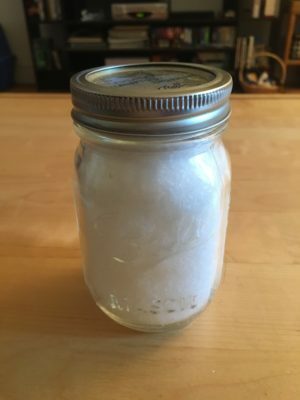 There are a bunch of different recipes that you can use to make a simple, scented bath salt. I’m including the one that I use more frequently. This recipe is simple and all the ingredients are easy to obtain. Most items can be found at a grocery store and things like the essential oils can be found at stores like The Vitamin Shoppe. Be aware that essential oils need to be understood and used with care. I did a lot of research about how to use essential oils safely and the chemistry involving how these oils interact with your body. 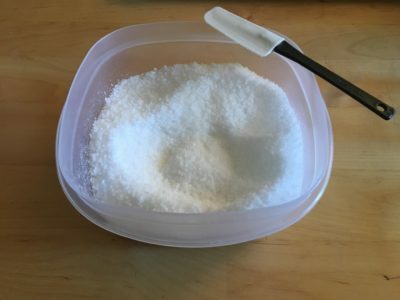 There are many types of salts that can be used in bath salt recipes but Epsom salts are usually the easiest to find. Next week, you can read about the different types of both salts and carrier oils that can be used in the making of bath salts. A carrier oil is a seed or vegetable oil used to dilute the essential oils before they are applied to skin. If you try to put straight essential oil into your bath water, you’ll notice that your skin will start to burn and irritate. This is because oil and water do not mix so the essential oils tend to float on top of the water. Then you get into the bath and the oils are attracted to the lipids in your body, causing irritation (usually made worse by the heat of the water). You should never add essential oils directly to the bath water, always make sure you are diluting them with either a carrier oil, salt or both. 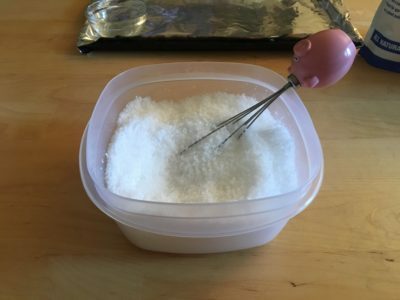 To begin, combine one cup of the Epsom salt, one cup of the kosher salt, and a half cup of the baking soda into the large bowl and mix together. Once you have those things mixed well, place off to the side and in a small bowl, add 2 tablespoons of your carrier oil. For the batch I made today, I used sweet almond oil. Be aware that if you plan to make a gift of these, check with the person about potential allergies! You don’t want to give someone who is allergic to almonds a bath salt that is made with almond oil. Next, add 20 drops of your essential oil to the carrier oil. You can mix different scents if you like. I used eucalyptus, lavender, and spearmint for a relaxing and head-clearing bath salt. Stir the essential oils into the carrier oil. 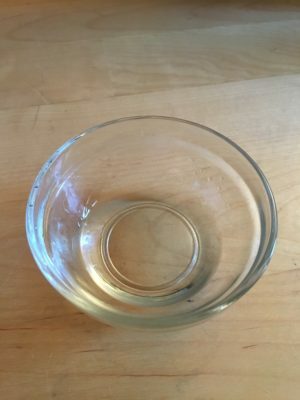 At this point, if you want to add a color to your salts, you can do so by adding a drop or two of food coloring to the carrier oil and mixing it in. You do not have to do this. Take your large bowl with your mixed salts and add the now mixed carrier & essential oils. Mix thoroughly with the whisk. (Make sure the dishes you are using for this either get cleaned really well or use dishes that are not used for food items). 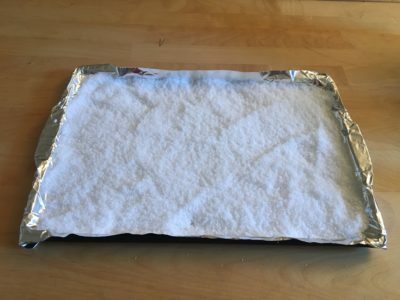 Once the carrier oil is thoroughly mixed into the salts, spread some aluminum foil onto the baking sheet and then spread the salts out onto the foil. Let sit for about 15 minutes. This allows the salts and the oils to dry out a bit and bond together. Then you can carefully pull up the corners of the foil and use this to pour your salts into your Mason jars for storage. I like to use Ball Mason jars because they have measurements on the side. 1 cup of the finished salts equals one bath. I hope you enjoy this recipe and there are a number of other recipes and tips to try from the internet as well. One can be found here along with a number of other fun DIY items (the focus of the webpage is for brides but some of the items can be for every day use also).